The aim of the project is to identify atmospheric visibility change predictors on a hourly time scale, among multi-sensor observation data sets, including ground-based instruments and satellites. The project involved the collaboration of CNRS and HYGEOS. computes fog formation probability according to 6 observed predictors [ Elias et al., 2017 ]. One shot of the PreViBOSS animated assistance decision tool. We also conducted a study on the impact of the hydrated aerosols composing the mist: they can have a significant impact in radiative transfer in the fog as they contribute by ~20% in the visibility drop at the fog formation [ Elias et al., 2009; Elias et al., 2015 ]. Particle extinction coefficient computed by Mie for different particle populations. 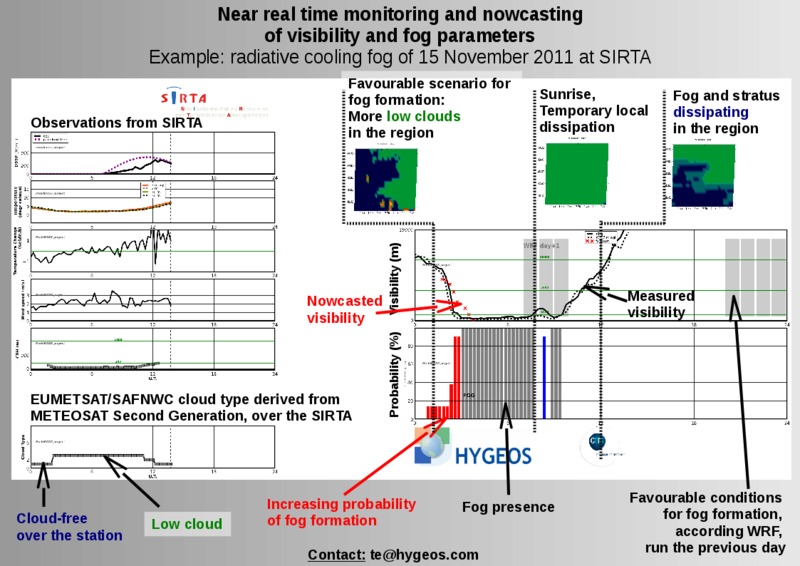 Extinction in the 2011/11/15 fog is caused not only by fog droplets but also by hydrated aerosols.